EV Sales in Canada in 2014: the year in numbers! 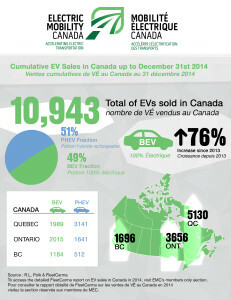 Electric Mobility Canada is happy to present the highlights of the 2014 EV sales numbers. EMC would like to thank its member FleetCarma for compiling the numbers. Please visit our members only section for the detailed report.